A quick question for you? What do you think about Paul the apostle? Was he a good pastor? Did he care about his congregations, about the very people whom he had brought to faith in Jesus through his ministry? Sure, he was and sure he cared. Everything that we can read about Paul testifies about Paul’s love and care for God’s holy people. But how come that this loving and caring man wrote harsh words like these? “For you may be sure of this, that everyone who is sexually immoral or impure, or who is covetous (that is, an idolater), has no inheritance in the kingdom of Christ and God.” And this is not the only place where Paul says things like this. The same way he writes to Christians in Galatia: “Now the works of the flesh are evident: sexual immorality, impurity, sensuality, idolatry, sorcery, enmity, strife, jealousy, fits of anger, rivalries, dissensions, divisions, envy, drunkenness, orgies, and things like these. I warn you, as I warned you before, that those who do such things will not inherit the kingdom of God.” The same way he writes to Corinthians. Can you explain how could this loving and caring man Paul say these heavy words? “Those who do such things will not inherit the kingdom of God.” How could he do that? Maybe, because it is true. Maybe because he loved God’s holy people and desired them to receive their inheritance in the Kingdom of God. Maybe because if he didn’t warn them, they could lose their salvation. So, what do you think about these lists which Paul makes? Why does he worry about all these activities? Does he want all Christians to be nice people and behave well? Paul is not concerned about superficial things. He is concerned about something that goes to the very heart of Christian faith. He is concerned, and he mentions it in every of these letter – with idolatry. That’s right, with idolatry. And we may wonder, what is this to do with us? Isn’t idolatry about worshipping statues and trees, and animals, and so on? No! No, idolatry is when we make something else more important than true God. Idolatry is when we trust that something else can give us more than true God. Idolatry is when we believe, that acting against God’s will could bring us more benefits, than living God pleasing life. Idolatry is when we make our daily decision based on what I would prefer, what I would like, what pleases me, instead of trying to discern what is pleasing to the Lord Jesus Christ. Sounds familiar? It certainly does to me. If you want to know what is our deepest problem, it is idolatry. None of us is free from it. And all these things that Paul listed, they all are about idolatry. All kinds and sorts of sexual promiscuity – we indulge them for we trust that they will give us more than God given marriage and gift of sexual intimacy. Greed and covetousness – we trust that possession and properties will give us more status, value, security, than the fact that we are created in God’s Image, redeemed by Jesus, and that the Father promises to provide for our daily bread. Envy, jealousy, strife, enmity, drunkenness and orgies… whenever we engage these things we do it because we trust that something else will give us more than true God. We do it because we trust our idols more than God. And we all are guilty of this – without exception. Do you know why Paul is so concerned with the idolatry of God’s people? Because this is the real reason that drives people away from Jesus and from His Church. If you want to know why we don’t have more Christians around here, or why so many who claim to be Christians, care neither about being with Jesus, nor about sharing the Gospel, nor serving their neighbors, – it is because of idolatry. If asked, people may provide different answers. Some may say, they don’t like people in congregation, they don’t like this pastor, they don’t like this music, they don’t like what the Church teaches, they don’t like this and that, and so on. The real reason is that their idols are stronger than themselves. And the greatest and the strongest idol of all is the idol of self. Me. Me! It is all about me! People who reject or ignore Jesus, they trust and believe that if only they will do what they want to do, and in a way they want to do it, they will be more blessed, than trying to discern what pleases the Lord and living accordingly. And once someone has chosen to trust the idol of self and other gods more than the Triune God the Father and the Son and the Holy Spirit, they need to justify themselves, so they will try to show how reasonable their position is. This is what Paul is warning against when he writes: “Let no one deceive you with empty words, for because of these things the wrath of God comes upon the sons of disobedience.” To go against God’s will is not a small thing. If someone engages in sexual promiscuity, will they do it saying – this is so bad, degrading for me and others, and displeasing to Jesus. Have you ever heard someone saying that? Take greed and covetousness. Who will admit that “I am greedy and worship mammon and don’t care that it displeases the Lord”. No, they will say – this is how this world operates, we all need to have this and that, otherwise you won’t fit into this society. Take the indifference to the Christ’s body, the Church. Who will admit and say, – I really don’t care that the Triune God comes to me and invites me. No, what you hear is, – you don’t have to belong to any congregation to be a nice person. I can be a good Christian wherever and however I want. This is Paul’s concern – idolatry. For idolatry explains why people are not with Jesus. For they prefer to worship themselves and those idols which they trust more and from which they expect more that from true God. What should we do, for none of us is free from idolatry? Paul’s advice is as simple as it is profound and comforting. Paul doesn’t go into moralizing, instead he speaks about who we are, about our new identity. Pay attention to what Paul says! “You were darkness, but now you are light in the Lord.” This is who you are. This is your true identity. And how did you get it? When you were baptized into the name of the Father, Son and Holy Spirit. When gracious Father adopted you as His child. Do you see the magnitude of what Paul is saying? He is not telling you to be a nice person. That would be so shallow and insignificant. That would be telling you what to do. He is saying something so much greater. He is telling you what you are. You and sons and daughters of God the Father. You are brothers and sisters of Jesus Christ. You are members of the Divine Family, the body of Christ, the Church. You are heirs of the Kingdom of God. This is what you are. Not less. See what is Paul saying? 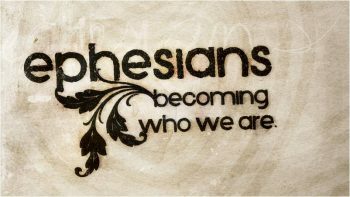 If this is who you are, if this is your new, God given identity, then live accordingly. Live out your identity so that the world can see it! Be different, for you are light in the Lord, walk as children of light, for the fruit of light is found in all that is good and right and true. But, how can we walk as children of light? It is so simple. You know what Jesus has done for you. The Son of God humbled Himself and become one of us. He took your place in God’s judgment. He did all of this so that He could send His Spirit into your hearts with these Good News, so that He could give you this new identity and so that you could rejoice being freed from your idols, and restored in trusting and loving relationships with God the Father. What is our response when someone does something that amazing for us? We try to express our gratitude by trying to please them, right? And this is what Paul says. “Try to discern what is pleasing to the Lord Jesus Christ.” He made you a child of God, respond with gratitude. This is the beauty of Christian freedom. This is the beauty of our lives. We know that we are accepted by the Father through Jesus. It’s done. We also know what life is pleasing to Him; when we live according to His will. And when we do it, it not only gives us joyful lives, it also makes us a blessing for others, and thus the light of Jesus shines in the darkness of this world so that people can come to it. I pray that you would see that our choice is not between being bad people or being nice people. We all struggle with our idols. It is about your core identity. You have been made light in the Lord, be light and don’t go back to darkness. You have been made free to serve Jesus, don’t go back into slavery to idols. Walk as children of light, for this is what you truly are. May the Holy Spirit Himself accompany you in this walk until you reach your true home, and see your Lord Jesus face to face. And the peace of God that surpasses all our understanding, keep your minds and souls in Jesus Christ.